Leeds United survived a scare to earn a place in the fourth round of the Emirates FA Cup, but the victory came at a possible cost for their return to the league in a big game against fellow promotion contenders Derby County this Friday. The Whites could face a defensive crisis after Pontus Jansson was booked for the tenth time this season to result in a two-match suspension and fellow centre-back Liam Cooper had to limp off in the second half. 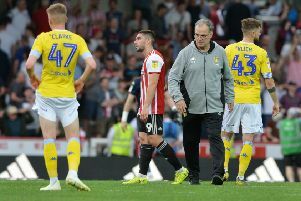 While Cooper’s injury was said to be an impact one and he has not been ruled out of the Derby game yet, he did leave the Cambridge ground on crutches and Leeds could be left with just Kyle Bartley as a regular centre-back for the match. Luke Ayling can move inside from his right-back position and would be the obvious candidate to step in, but with full-back Charlie Taylor still out it is far from ideal to go into such an important game without so many of their frontline defenders. Friday’s game at Elland Road looks to have the look of a six-pointer about it with United in fifth in the EFL Championship and Derby in seventh, just outside the play-off places. A home win would open up an eight-point gap between the teams and give Leeds real breathing space in the promotion race. Ironically head coach Garry Monk left out eight of his first team players at Cambridge and took two others off before the hour mark to help protect them for a match in which because of TV scheduling Leeds have two days less preparation time than their opponents. He was unhappy with the Jansson booking, which he described as undeserved, but with yellow cards unable to be rescinded he will have to accept he will be without the impressive defender for the Derby match and the following week’s equally important trip to eighth-placed Barnsley. On the injury to Cooper, the Leeds boss said: “We are very hopeful Liam Cooper will be available, we will know more by the end of today (Wednesday). “It was an impact injury, a clash of legs, so we’re hoping it’s not too serious. “It inflamed straight away so there was no risk from us. We took him off and we’re hoping it settles down and he’ll be ready for Friday. “We have to deal with whatever’s thrown at us. It’s the hand we get dealt and we have to overcome it. Our mentality’s strong but we’re very hopeful that Coops will be okay. “If he’s not (available) we’ll come up with something to make sure we adapt. Monk acknowledged the points are important from Friday night’s game and that his side would be up against another team in good form. He added: “Every game we play is a big game, Derby will be a difficult game for us, and they are doing very well. “With the squad that they have, Derby will be expected to get into the play-offs, we have to be ready for that. “We are very focused on ourselves, though, we know if we put our best football on the pitch, we can win games.